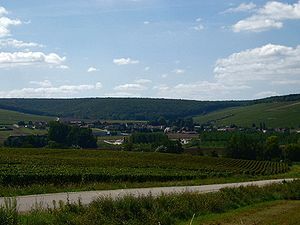 Chablis is a large region in the Yonne Départment surrounding the Serein River. The region is about half way between Champagne and Sancerre and just a few miles southeast of Champagnes Aube region. Chablis is the northern outpost of Burgundy and has a total of 10,000 acres of vines planted. The AC’s are Petit Chablis (1,200 acres), Chablis (6,700 acres), Chablis Premier Cru (1,800 acres) and Chablis Grand Cru (262 acres). There are two regions in the neighborhood that allow other grapes besides the ubiquitous Chardonnay (which is the only grape allowed in Chablis et al). Just south in the greater Départment of Yonne are Irancy and Saint-Bris. Irancy is the area’s only red wine produced from Pinot Noir and a tiny bit of César (a grape from the Roman era), while Sauvignon Blanc is the grape of Saint-Bris, hence it’s AC of Sauvignon-St-Bris. The reason we see Sauvignon Blanc here in this part of Burgundy is the region shares both the soil and climate of Sancerre. So it actually makes sense. There are seven Grand Crus (the best vineyard sites) in Chablis and forty Premier Crus (second best sites), though the rules for Chablis Premier Cru allows the lesser known vineyards that are designated as Premier Cru to be labeled as the closest of the seventeen most famed Crus. (*a Cru is the French name for a specifically named site/vineyard). The seven Grand Crus from west to east are: Bougros, Les Preuses, Vaudésir, Valmur, Les Clos and Blanchot. As each great producer doesn’t own vineyards in every one of these, each has an opinion of the best based on their holdings! But the general consensus is that Les Clos is the best. The Les Clos vineyard is so steep that in 1954 the locals used it for skiing. The Premier Crus that are closest and have similar climate and soil (and since they use the same grape, winemaking techniques, culture and food the similar Terroir) are the best. Those vineyards are Mont Milleau, Monte de Tonnerre and Fourchaume. Chablis is divided into a hierarchy; which is considered to be in the lowest level in quality? How many Grand Crus are in Chablis? How many Premier Cru vineyards are in Chablis? How many Premier Cru names are relevant today? What are two factors that make the vineyards of Grand Cru Chablis better than surrounding Chablis vineyards? What makes the Petit Chablis AC inferior to Chablis AC, Chablis Premier Cru and Chablis Grand Cru? What river flows through the Chablis region of France? Which Chablis Grand Cru is considered the best and steepest? Which Chablis Premier Crus are closest to the Grand Crus in both quality and geographically?